We are lucky enough to live in an apartment with A Beautiful, Spacious, Outdoor Patio/Garden out front. It has A Large Avocado Tree growing in the center of it, providing lots of Shade. The floor of The Patio is slate and brick. It is large enough for us to have a small table and four chairs, as well as some comfortable, lounge seating. There is even a white picket fence. The first thing I do every morning is go to my computer and check my e-mail. My computer is set next to one of our front windows, lending me a good view of The Goings-On Of Our Patio. Usually I find our neighbor’s cat curled up on one of our cushy seats. Sometimes, I see a hummingbird! Most days, I see The Squirrels in our neighborhood Fighting Over Food. They eat all of the avocados in our tree before we can get to them, pushing each other out of the tree in hot pursuit of the fruit. Someone nearby feeds them peanuts, which they bury in my flowerpots and will dig up, along with my flowers, when no one is looking. We call these Warring Squirrels, Hamas and Fatah. We identify them by their Distinguished Markings: Fatah is Missing Half His Tail and Hamas has Huge Balls. Recently, another, even Meaner Squirrel has joined The Frenzied Fight For Food. We have named him, Hezbollah. His tail is Flat. His Balls are just average. Wait? Did I just write, “The Frenzied Fight For Food?” Those were The Good Old Days. 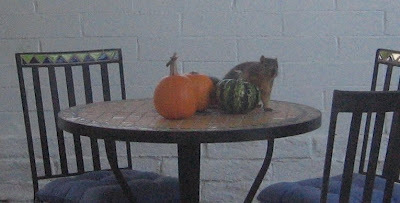 Now, The Sly Squirrels have gone Ga-Ga For Gourds! After Halloween ended, we took down all of Our Decorations, but left The Gourds and Mini-Pumpkins scattered about for Thanksgiving. But, the other morning, I was sitting at my computer when I saw Fatah sniff around our patio and snag A Yellow Gourd! The Gourd was a big one -- larger than Fatah. Yet, Fatah managed to grab The Gourd and run across the street with it. “Hey! Stop, you stupid squirrel! That’s My Gourd!” I shouted. Alas, I was One Gourd Down. I thought that it may have been just A Single-Day Stupid Squirrel Situation, but over the next few days, I have discovered that nearly All Of Our Gourds are Gone! Mini-Pumpkins are Missing! Dotted Green Things have Disappeared! In fact, the only thing left are Two, Small Orange Pumpkins and One Funky Green And Yellow Pumpkin. I think they are left because they are Too Heavy for Hamas, Fatah, or Hezbollah to Carry and Run Off With. Stupid Squirrels. I hope all that Uncooked Squash makes them Sick. Our squirrels have been Crazy lately. I wonder if it is the season? Perhaps they are all hopped up on Halloween candy? It makes me lose my mind. "His Balls are just average" made me laugh out loud. Just thought you should know that. Squirrels with huge balls sounds like a nuclear side effect. LOL. Si it just the photo, or is that squirrel a little on the heavy side?